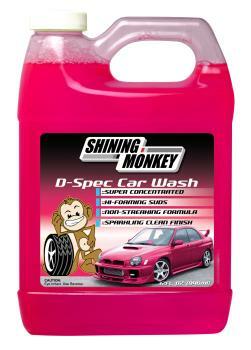 Shining Monkey D-Spec Car Wash UNIVERSAL - Dezod Motorsports Inc - Home of the automotive performance enthusiast since 2002. When it comes to cleaning your ride, the D-Spec Car Wash is all you need because it features a strong, yet harmless formula, leaving your paint and clear coat safe and secure. Using a concentration of an emulsifying wash, the Shining Monkey D-Spec Car Wash allows you to clean, shine, and protect in one simple step. The D-Spec Car Wash is a no-brainer when it comes to choosing a wash. It cleans thoroughly, it’s strong and non-toxic. It removes harsh contaminants without stripping your paint, cleans the surface down to a sparkling shimmer, and protects your vehicle from airborne pollutants. Unlike other car wash formulas, the D-Spec Car Wash gives you an appealing bubble gum scent, providing an overall fresh sensation. You should always clean from the top of the car to the bottom. Remember the bottom areas are usually a lot dirtier, plus you won’t contaminate the clean areas with that filth. Dry the car the same way leaving the lower areas and rear for last.